Just after his father’s death, a letter of attorney from John’s mother Elizabeth assigned him the rents of her share – a third – of the real estate. The letter, dated 30th October 1691, adds that the other two thirds of the rents were to go towards the education of his brothers and sisters. Indeed, his younger brothers William and Thomas both signed the letter as witnesses. However, it seems Elizabeth was unhappy with this arrangement and subsequently revoked it because it had been “drawen contrary to my intention direction and compleyance”. The confusion over dates comes to play here as this revocation is dated 17 January 1691, which is, of course, before the above-mentioned letter of attorney or Henry Ivers death. It may be relevant that the signatories of this revocation appear to include John’s brothers William and the disinherited Henry. As well as being born a Norton, Elizabeth was also a niece of Captain Arthur Blennerhassett, collector of poll tax for Co. Limerick. Captain Blennerhassett, who died in 1696, was one of the ’49 Officers who served for Charles I in Ireland in 1649. Colonel Ievers youngest sister Ellen was married to an Arthur Blennerhassett, but it is unclear if this was the same man. During the troubled times of 1688 and 1689, Augustine Fitzgerald had proven ‘a kind friend’ to Captain John “Black Jack” Blennerhassett of Castle Conway and his brother Thomas, supporters of William of Orange, who were imprisoned in Galway and Dublin for 14 months by James II’s supporters. We also know nothing about John’s fifth brother Robert. However, we do have some details about his fourth brother, Thomas, who had land at Graygrove, near Kilmihil, West Clare, and also in the O’Brien barony of Corcamore. As well as Henry, Thomas had another son George Ivers (who married and had a son James) and a daughter Elizabeth. A deed dated 28th January 1714 refers to Thomas and his son Henry (who succeeded to Gray Grove) and states that on completion of the deed, Thomas was to discharge various debts. Thomas Ivers of Corcamore [sic] was involved in a dispute with Sir William Barker that came before the House of Parliament in 1727 and 1728. John youngest sister Ellen was married to Arthur Blennerhassett, as stated above. His other sister Martha married Donnogh O’Bryen of Dough, Co. Clare. Donnogh was a great-grandson of Sir Turlogh O’Brien and a grandson of Daniel O’Brien of Dough who steered the family safely through the Cromwellian conquest, being one of the few Catholic gentry to be awarded a certificate of ‘constant good affection’. Daniel also earned widespread praise for his kindness to shipwreck survivors in 1642. In 1682, Donnogh was granted lands in the baronies of Corcomroe, Burren and Inchiquin, amounting to over 5,000 acres. Donnogh’s parents were Connor O’Brien and Elena O’Shaughnessy. His maternal grandfather was Sir Dermod O’Shaughnessy, Knt., of Gort, County Galway, an estate which later passed to the Prendergasts. In another generation, intermarriage between the Ievers and the Catholic O’Shaughnessy family would lead to disinheritance. In 1703, John Ivers considerably increased the size of his landholdings, buying up property from the Chichester House Commissioners in Dublin. All of these lands came from families who had been attainted for their adherence to the Jacobite cause over a decade earlier. He purchased the Co. Clare estate of the attainted Colonel Richard Grace at Cloontra, Nicholas White’s forfeited estate at Ballybroughan and – together with John Cusack of Kilkisheen and Hector Vaughan of Knocknemail, King’s County (Co. Offaly) – he also acquired part of the Cloongaheen estate of Captain Teigue O’Ryan and his brother John, who were attainted in 1696. It is possible that John was the ‘Colonel Ivers’ who, alongside General William Cadogan (later 1st Earl of Cadogan, pictured), was appointed Quarter-Master by the Duke of Marlborough and entrusted with setting up encampments as the army marched from the Spanish Netherlands through Franconia to the Danube in 1704. Ivers and Cadogan were described as ‘men of great dexterity and skill in everything relating to that business’. This placement of John Ivers on the frontlines of the War of the Spanish Succession becomes ever more likely when one considers that Colonel John Ivers’ daughter Lucy married Jeffrey Prendergast, whose brother Sir Thomas Prendergast was married to Lord Cadogan’s siser Penelope. At the General Election of 1715, called shortly after George I succeeded Queen Anne to become King of Great Britain and Ireland, the Whig party swept to victory. Amongst those elected was Colonel John Ivers who, alongside Francis Gore, defeated the O’Briens, Sir Donough and Lucius. He was to remain MP for Co. Clare through until 1727. Gore fared rather less well and died the same year as the election; George Purdon filled his seat in a bye-election. Amongst some of the earliest documents pertaining to his new role as MP are some letters from 1715 and 1716 to Sir Donough O’Brien, 1st Bart., concerning proposals to build a barracks at Sixmilebridge. Prior to his election, there also seems to have been some questions raised locally about precisely how much profit the Colonel was making from a moiety he held on the Sixmilebridge lease. This is presumably connected to the evolving industrialization of the area, with the increase in millers of Dutch origin operating along the riverbank, and a growing trade with the Netherlands. Amongst Colonel Ivers’ employees was Roger Cusack whose job was to be ‘a servant to look after ye workmen’. His son Edward Cusack, born about 1684, would go on to become one of the greatest patrons of Dr. Steeven’s Hospital in Dublin. The Inchiquin Manuscripts include details of a case in 1727 of John Ivers against Sir Edward O’Brien, Sir Donough’s young heir, who unseated the Colonel at the election of that same year. 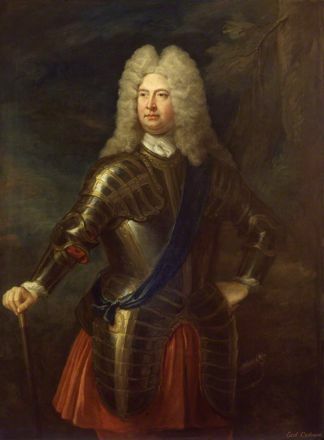 The consequence of the case obliged the Colonel’s son Henry to reach an agreement with Sir Edward and appears to have prompted a shift in local influence. The Colonel was by now an old man and he died in the winter of 1729, shortly after Jonathan Swift, Dean of St. Patrick’s Cathedral, published “A Modest Proposal”, his sharp satire of the Irish predicament proposing that the rich should eat the children of the poor, to the benefit of both parties. Colonel John Ievers was buried on 4th December 1729 and it appears his wife died five years later. An old brass sun-dial at Mount Ivers bears the inscription ‘Margaret Ievers, Julye 18. 1733’. It seems likely this was the Colonel’s second wife and the date she died. The 1st Earl of Cadogan, a kinsman of the Ievers.